Decisions about future energy sources will need to factor in water consumption as well as greenhouse-gas emissions. 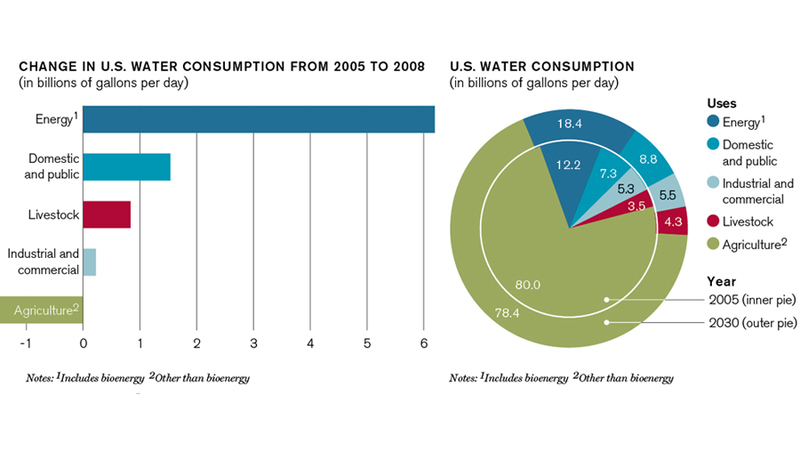 In the United States, energy production will account for almost 90 percent of the projected increase in consumption of freshwater between 2005 and 2030, according to Argonne National Laboratory. Power plants that use nuclear fission or fossil fuels, such as coal and natural gas, consume billions of gallons of water per day for cooling. Fossil-fuel plants that use carbon-capture technologies to cut carbon dioxide emissions consume even more water than conventional ones. As for renewable energy sources, they pre­sent a mixed water-use picture. While wind power and photovoltaic solar power use little water, solar thermal power—one of the fastest-growing renewable sectors—uses a great deal. Biofuels from non­irrigated sources, such as switchgrass, use relatively little water, but ethanol made from irrigated corn is hugely water-intensive. In the chart at right, we compare recent estimates of average lifetime water consumption and greenhouse-gas emissions for various electricity sources and transportation fuels. Note the water-use range of irrigated corn ethanol. The water consumption associated with E85, a blend of 85 percent ethanol and 15 percent gasoline, ranges from 20 to nearly 1,000 gallons per 100,000 BTU, depending on agricultural practices. “Geothermal” refers to flash-steam-powered plants and is given in grams of carbon dioxide (gCO2) per 100,000 BTU. All other figures are given in gCO2 equivalents per 100,000 BTU. 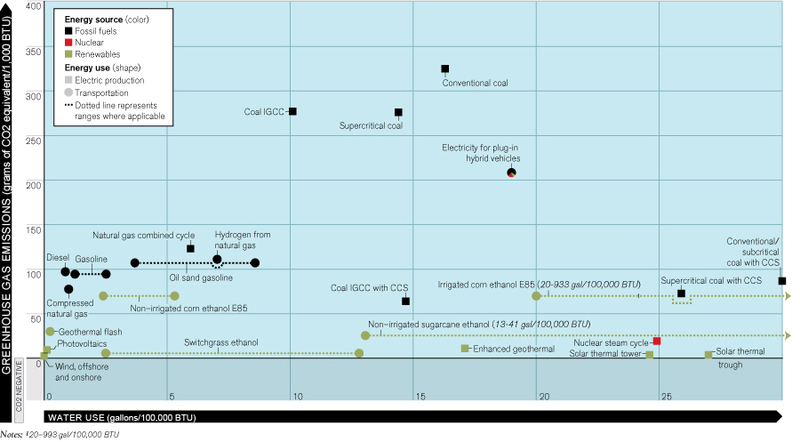 “BTU” refers to British Thermal Units; “CCS” refers to carbon capture and storage technologies; “IGCC” refers to integrated gasification combined cycle. One gallon of gasoline is equal to 114,500 BTU. The water intensity of sugarcane is an estimate for São Paulo, Brazil, where the crop is not irrigated. The water intensity of ethanol from switchgrass is an estimate based on a relatively small amount of data. The figure given for greenhouse-gas emissions associated with compressed natural gas used in transportation assumes that the natural gas is extracted and used in the United States.